You just have to love a Pope who knows how to Pope. Three years ago this very weekend, the press was up in arms over the election of Benedict. Too conservative, mean, and retrograde. A dark day for the papacy and the Church, so they said. We still heard a little bit of that this week, most notably from Lisa Miller in this week's issue of Newsweek. But most of the commentary was like George Weigel's. His praise for Benedict was echoed by the cynical D.C. media. Why? Because this Pope took the nation by storm, revealing a charismatic compassion for people most thought could not exist in the man. His meeting with victims of sexual abuse by clergy was groundbreaking in an historic sense. His hope and joy continued to grow palpably throughout the week. Catholics in America feel a sense of importance about themselves that they have never felt before. Benedict thinks we matter! A lot! Again, his ability to challenge people and still make them feel good about themselves is a gift no one thought he had. Young people love him. Old as he is, he still believes there is good in this world, and he makes you feel that he is looking at the good when he sees us. 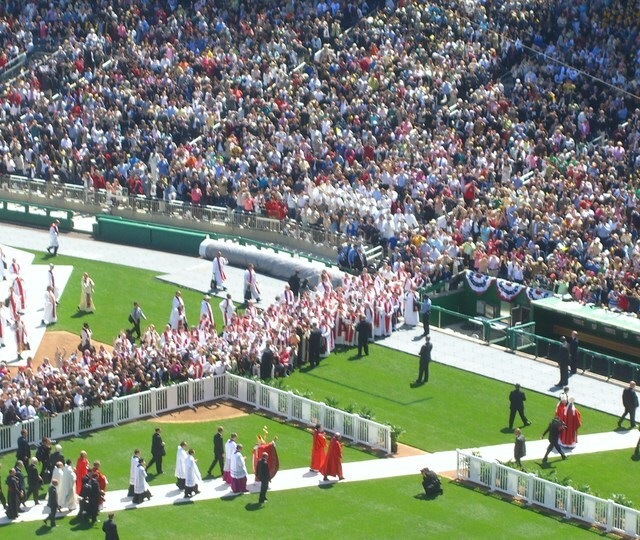 48,000 people attended the Mass at Nationals Stadium. I was amazed how such a big place could become so quiet when asked to pray. It was very moving, but when Placido Domingo sang Panis Angelicus people were in awe. And when the Pope left his chair to greet the singer, you could see how appreciative he was. It was at that moment the solemnity of the event gave way to enthusiastic celebration. The Pope was cheered down the aisle by tens of thousands. All of us, including him, just got into the moment. Lisa Miller's article says that the Pope doesn't connect with people and is out of touch. Must be a different Pope. This one has got the feel of America and let's us know he likes what he sees. Everybody's in awe so far--a good trip and a wonderful visit from a great man! 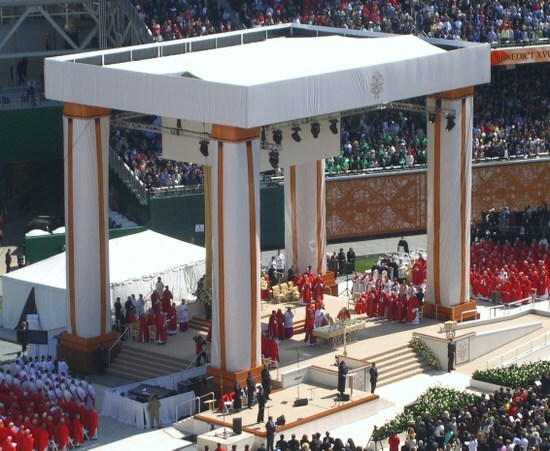 THE POPE IN WASHINGTON, D.C. 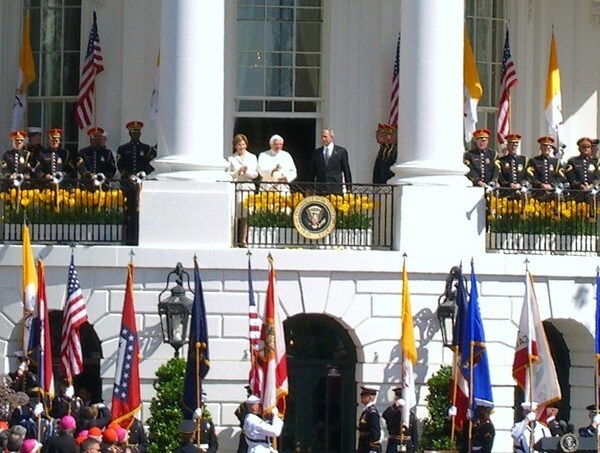 THE POPE AND THE PRESIDENT: GOD BLESS AMERICA! The President and the Pope get along great. It is obvious they have a very good relationship. The Pope loves America. He said it many times and is clearly grateful to us and our culture while continuing to call us to further perfection. 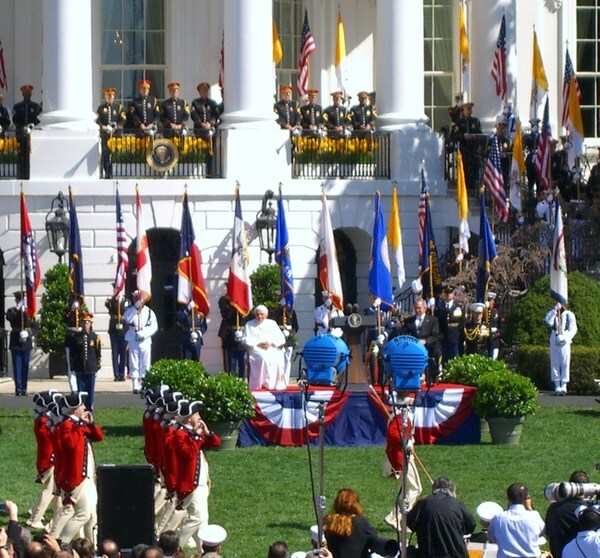 The coming together of secular and religious at the White House ceremony was absolutely beautiful. Both the President and the Pope could have exchanged each other's speeches, so closely did they resemble each other. Dignity, freedom, responsibility, the sanctity of life, the importance of courage, character, integrity--all of this united under God Almighty's Hand. Such a festive atmosphere. D.C. can be a tough town, but people were happy and joyful. This Pope really put a spark of hope and optimism into this rather cynical and vision challenged political town. Now, those are just the broad brushstrokes. I'll talk about the Mass tomorrow and finish up with some comments on the essence of the Pope's message. The welcome at the White House will always be a highlight in my memory. From Hail to the Chief with the President coming out the White House and then the Pope coming up in his motorcade, to the Our Father, to the Military Fife and Drum Band, to the Marine Choir singing the Battle Hymn of the Republic, to the 21 gun (really cannon) salute--all this made me so proud to be Catholic and an American. Great day, great trip, great Pope. 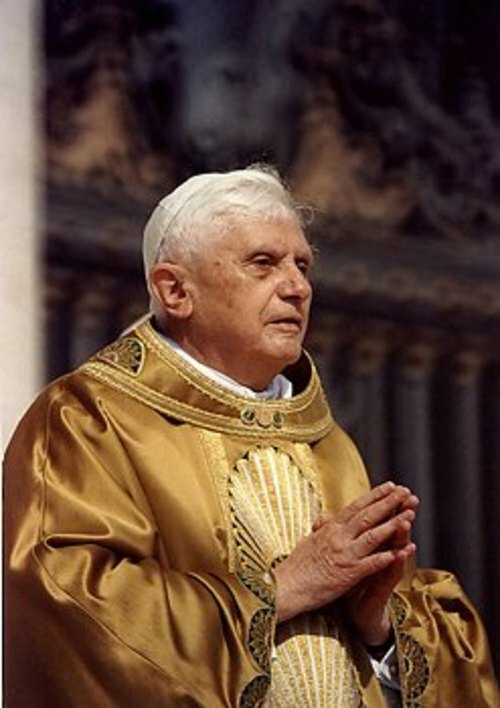 POPE BENEDICT COMES TO THE USA! The coming visit of the Pope is sure to bring much commentary--most of it shallow and predictable. None the less, my hunch is the Pope will have some groundbreaking things to say to us concerning our faith and our purpose in the world. Whatever he says will be easy to understand, even if difficult for some to hear and follow. I'll be going to Washington to hear him and will report on what I see and find. It's been a while since a Pope has visited us. Look for some excitement, some challenge, but most of all, look for how a good and decent man can make a difference in the world. May God bless the Pope; may He keep him safe and hold him in the palm of His hand. I mentioned Mr. Heston at Mass today and asked people to pray for him, not because I'm some starry eyed fan but because, in actuality, I think he is responsible for bringing many folks to God. 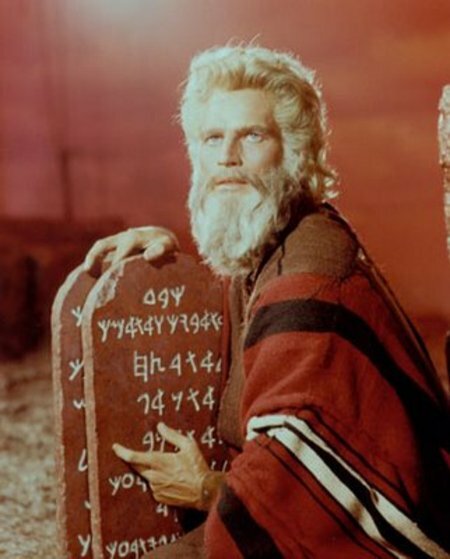 His portrayal of Moses remains his greatest achievement among many and is so riveting that two generations of people have grown up thinking Moses and Heston are one and the same! I remember visiting Mt. Sinai many years ago. What an impressive place! I looked around and said, "One thing would make this complete...if Charlton Heston walked down that mountain at this moment." He would have fit like a glove in that magnificent setting. If you're reading this, tell me the truth, over time you've come to believe, like I do, that the true voice of God must sound an awful lot like Mr. Heston's. I'm always in awe of those who bring us joy and hope. Mr. Heston did that and more. He gave a face to faith and helped us imagine what it must have been like that long ago day when the sea parted and the People of Israel marched to freedom. Though I'm sad to see him go, I pray most hopefully that he walks with God in glory and receives a just and lasting reward of eternal life. Rest in peace.